Definition at line 1848 of file lscript_tree.h. Definition at line 1851 of file lscript_tree.h. Definition at line 1856 of file lscript_tree.h. Definition at line 7555 of file lscript_tree.cpp. 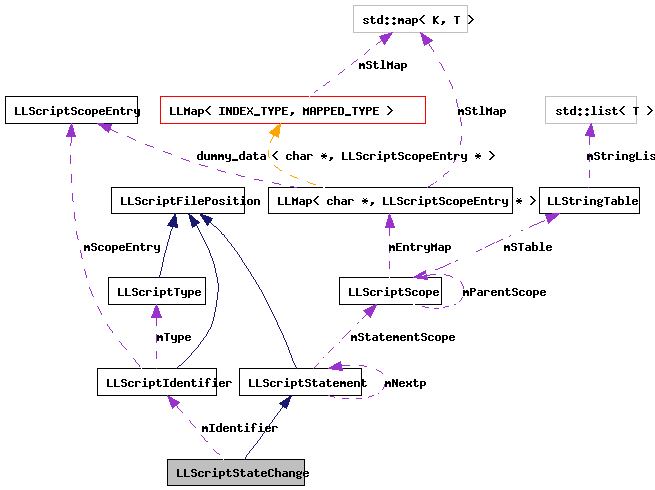 Definition at line 7560 of file lscript_tree.cpp. References add_exit_pops(), LLScriptByteCodeChunk::addByte(), LLScriptByteCodeChunk::addInteger(), FALSE, LLScriptFilePosition::fdotabs(), LLScriptScope::findEntryTyped(), gErrorToText, LLScriptGenerateErrorText::getErrors(), LLScriptStatement::gonext(), LIT_STATE, LOPC_STATE, LSCP_EMIT_ASSEMBLY, LSCP_EMIT_BYTE_CODE, LSCP_EMIT_CIL_ASSEMBLY, LSCP_PRETTY_PRINT, LSCP_PRUNE, LSCP_SCOPE_PASS2, LSCRIPTOpCodes, LSERROR_STATE_CHANGE_IN_GLOBAL, LSERROR_UNDEFINED_NAME, LSPRUNE_DEAD_CODE, LSPRUNE_GLOBAL_NON_VOIDS, LSPRUNE_GLOBAL_VOIDS, LLScriptScopeEntry::mCount, mIdentifier, LLScriptIdentifier::mName, LLScriptIdentifier::mScopeEntry, NULL, print_exit_pops(), LLScriptIdentifier::recurse(), TRUE, and LLScriptGenerateErrorText::writeError(). Definition at line 1863 of file lscript_tree.h.